(Nanowerk News) NanoInk announces the release of the NLP 2000, a desktop instrument designed to provide cost-effective, rapid and reproducible nanoarrays. 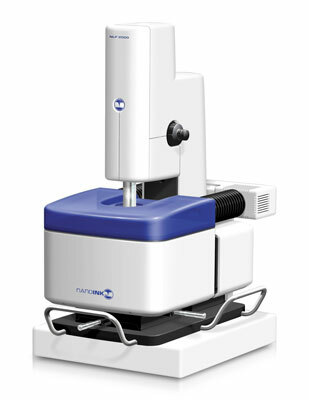 The NLP 2000 is a desktop nanofabrication system that is both simple to use and readily affordable. Patterns of nano- to micro-sized features may be created using a variety of materials from metal nanoparticles to biomolecules. Researchers are able to rapidly design and create custom engineered and functionalized surfaces using the proven technique of Dip Pen Nanolithography® (DPN®) to transfer nanoliter or smaller amounts over a large, environmentally controlled area. Operation of the NLP 2000 offers significant advances over current micro-arraying systems. To start, the system offers arrays of pens to write simultaneously over areas as large as 40mm x 40mm. The pens will deliver a spot size over a broad dynamic range of 50nm up to 10’s of microns. Using NanoInk’s Inkwell devices, multiple materials may be deposited in one step. The NLP 2000 will write onto a diverse range of substrates including Petri dishes, and coverslips. The use of a standard optical microscope slide makes the creation of the arrays easily portable to various standard detection systems. The large format and work area also permit the use of a variety of tissue culture plastic dishes. Designed to serve the increasing need for large area deposition of nanoarrays, this new DPN-based instrument is the first capable of fabrication of sub micron features over large areas. The NLP 2000 will make its debut at the Pittsburgh Conference and Exposition in Chicago, March 8-13, 2009, in booth #2315. Alternatively, more details may be found by visiting www.nanoink.net.